Crude oil production did grow significantly during Obama’s presidency — up 77 percent — but experts, including the federal government’s Energy Information Administration, have said the growth is largely due to technological advances, such as fracking and horizontal drilling. We said the same thing when President Donald Trump tried to take credit for the U.S. this year overtaking Russia as the No. 1 crude oil producer. Obama made his comments during a moderated discussion with former Secretary of State James Baker on Nov. 27 at the Baker Institute for Public Policy at Rice University in Houston, Texas. He was asked about his accomplishments during his time as president, and he began by listing the Affordable Care Act as “a starter house on the path to a smarter, more rational health care system.” Then he said he was proud of the Paris Agreement, an international agreement on climate change, but noted fossil fuel production also went up during his tenure. Obama, Nov. 27: I was extraordinarily proud of the Paris Accords because, look I know we’re in oil country and we need American energy. And by the way, American energy production, you wouldn’t always know it, but it went up every year I was president. And you know that whole suddenly America’s like the biggest oil producer … that was me, people. U.S. crude oil production increased by 77 percent from 2008, the year before Obama took office, to 2016, his final year as president, according to the EIA. At the same time, the U.S. reliance on imported oil dropped by more than half. In 2016, the U.S. imported 24.4 percent of the petroleum and refined products that it consumed; the figure was 57 percent in 2008. The United States overtook Russia in June to become the world’s top oil producer. The latest monthly data from EIA show the United States produced 11.3 million barrels per day in August, while Russia produced 10.8 million. Saudi Arabia produced 10.5 million barrels per day that month. But — just as we’ve written about a president’s impact on gas prices — market forces played a large role in driving that production increase. The EIA, too, has said the boost in production was due primarily to increased use of these drilling technologies. “U.S. 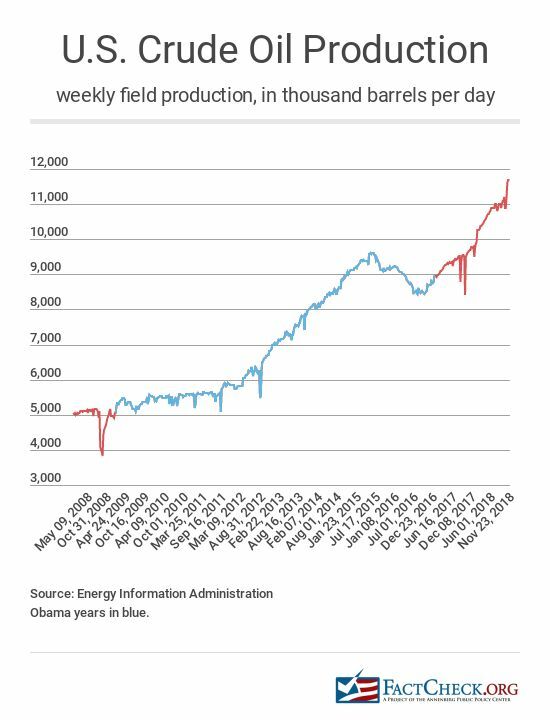 crude oil production has increased significantly over the past 10 years, driven mainly by production from tight rock formations using horizontal drilling and hydraulic fracturing,” the EIA said in April. It estimated that fracking accounted for about half of U.S. crude oil production in 2016. “If you ascribe credit based on it happened on my watch, then absolutely” Obama deserves credit, Frank Verrastro, senior vice president and trustee fellow with the Energy and National Security Program at the Center for Strategic and International Studies, told us in a phone interview. But there were a lot of factors that contributed to the increased production, including some that were Obama’s doing. First, the geology was good for unconventional oil and gas — extracted using hydraulic fracturing, Verrastro said. This started with gas in 2006 and then took off with oil a few years later, at the same time oil prices were rising. Crude oil prices were $44.51 per barrel in January 2005, according to the international Brent benchmark, up to $62.99 a year later and $92.18 in January 2008, peaking that summer at more than $130 per barrel, before plummeting during the Great Recession. “What we learned from the shale gas was translated to shale oil or unconventional oil and the production took off,” Verrastro said. Those higher prices were an “excellent incentive for oil companies to say … ‘Why not spend more on this?’ So that’s exactly what the oil industry did,” Patrick DeHaan, senior petroleum analyst at GasBuddy, told us. “I would disagree that [Obama] deserves anything but a minuscule amount of credit,” DeHaan said, saying it was the oil industry that gets the credit. One thing, however, that DeHaan and others mentioned was Obama signing a fiscal 2016 omnibus spending bill that lifted a 40-year-old prohibition on most oil exports. That expanded markets for domestic producers. The legislation was described in news reports as a bipartisan compromise, with Republicans getting the export ban lifted and Democrats getting extensions on wind and solar tax credits. Obama signed the legislation on Dec. 18, 2015. Kloza told us it was “ironic to see the oil production growth during the Obama terms” considering he advocated decreasing dependency on fossil fuels. “He can also take credit for significantly decreasing the carbon footprint, emissions, etc. and he played an active role in emphasizing policies that did so,” Kloza said. As for the U.S. taking that No. 1 spot among the world’s crude oil producers this year, the International Energy Agency had predicted several years ago that it would happen. In its 2012 World Energy Outlook, the IEA said the U.S. would become the top oil producer by 2020. The U.S. had already been the world’s No. 1 producer of petroleum, which includes both crude oil and refined petroleum products, such as gasoline, since 2013, and the top producer of natural gas since 2009, according to EIA. "That whole suddenly America’s like the biggest oil producer … that was me, people."